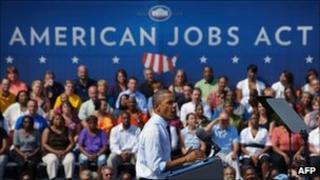 Can Obama jobs plan pass? In his speech to Congress the other day, President Obama sounded like an old-time preacher with his thumping refrain "pass this bill". Today, in Ohio, his call got a response. "Pass this bill," chanted the crowd right on cue. There's little wonder he is warning America could be left behind. There were more bad statistics out today. There are 43.6 million people living in poverty in the USA now. Not just the highest number but the highest proportion - 15.1% - for 17 years. Mr Obama needs to inspire. "Lift your voice," he told the Ohio crowd. "Call and email and tweet your congressman. The time for games and gridlock is over." He built to a crescendo: "If you want construction workers back in work what do you do? 'Pass this bill!' If you want teachers back at work, what do you do? 'Pass this bill!'" One first-time voter in the crowd should be pleased by the power of the speech. The president was talking at Fort Hayes art and design college and one pupil, 18-year-old Mel Dodge, told reporters he was an aspiring lyricist and admires Mr Obama's skills. "He chooses his words so beautifully," said the teenager. "That's why I came out here today, just to hear that in person." He wasn't so certain about the politics, unsure that the president's jobs plan would work. He wanted to look at the Republican field as well before he decides how to cast his first vote. If Mr Dodge is not convinced, it won't be through lack of White House effort. Senior advisor David Plouffe is just the latest to offer to answer questions by tweet. I've just got a detailed White House email on the beneficial impact of the act on Montana. Why Montana, I know not, but I am sure 49 similar missives will soon be in my inbox. The objective is not just to persuade Americans of the merit of his plan. It is to paint his opponents as wreckers. He got backing on Tuesday for more spending from the Congressional Budget Office's director, who warned cuts could damage recovery. But the president's plan is ideologically objectionable to most Republicans, even more so now that he has revealed how it would be paid for: by taxing what they would describe as "wealth creators" and what Obama would call the rich, oil companies and corporate-jet owners.